If you are in California and have won a money judgment, there is a chance that your debtor may or may not pay. Certain laws are applicable for judgment enforcement in California which affect the collection process. Judgment collection mainly refers to the collection of a certain amount of money. You have to find out the bank details of the debtor. This will include details like the bank’s name and the branch location of the bank. Once you find the bank, you need to get authorization to levy the bank. To do this, you will need to get the Writ of Execution (form EJ-130). You need to fill in this form and make three copies of it. After filling out the form, you need to have the Clerk’s office issue an official Writ of Execution. One copy needs to be filled by the local sheriff, the other by the state and the third one for record keeping. Once the paperwork is completed, you need to get in touch with the sheriff’s office and know how to get a levying officer. Once you have a levying officer, you need to provide them with all the details, including the bank name, bank account and when to levy the account. The levying officer will make use of the Writ of Execution for a Notice of Levy (EJ-150) and give to the bank. The is the final step which involves the levying officer to collect the amount and provide the creditor with the info who will get in touch with you. Get to know the debtor’s place of work. Next, you will need to get the Writ of Execution (form EJ-130). You need to fill in this form and make three copies. Then you need to have the Clerk’s office issue an official Writ of Execution. You will have 180 days before the Writ will expire once the clerk has issued it. Complete WG-001, which is all about applying for the earnings withholding. Approach the local sheriff’s office with the Writ of Execution and let them complete the WG-001 form. After the Employer’s return has been finalized, you need to be aware of the payment structure. If the debtor does not object, the levying officer will be able to gather the wages according to the court order. Get a levying officer. This is done by going to the local sheriff office and inquire about the civil money judgment. Once you do this, you need to get to the location and know about their till tap fees, how to get the forms and also the copies that you require. Give the levying officer all the necessary instruction and info, including when the business expects to receive a significant amount of cash. The levying officer will follow the instructions so as to help you collect your money. Once collected, you will be informed. Know the business location and name once you have the Writ of Execution, Declaration of the Accrued Interest, Cost Memorandum after the Judgment and the Acknowledgment of Credit. The paperwork should be done by the clerk and given to the sheriff. The sheriff will be instructed to have a keeper at the business. The sheriff will proceed with the collection for the firm when instructed. The proceeds will be distributed accordingly. 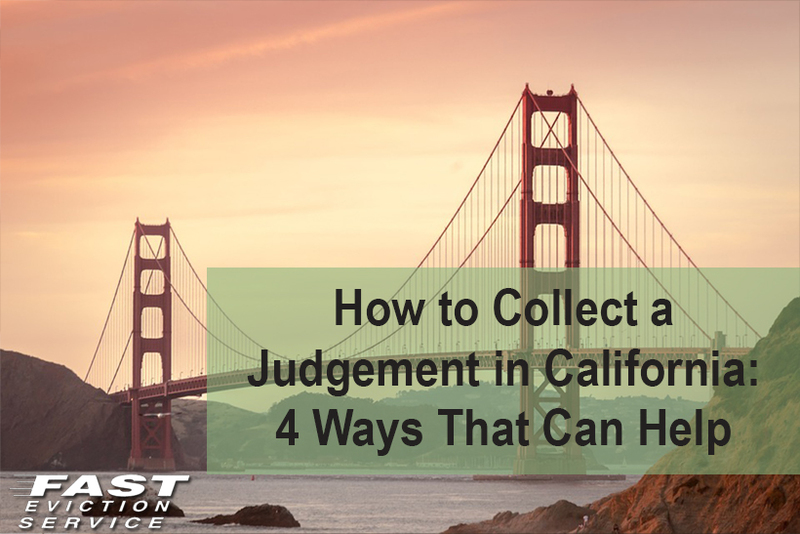 These are just a summary of various processes that you can utilize when it comes to collecting a money judgment in California.